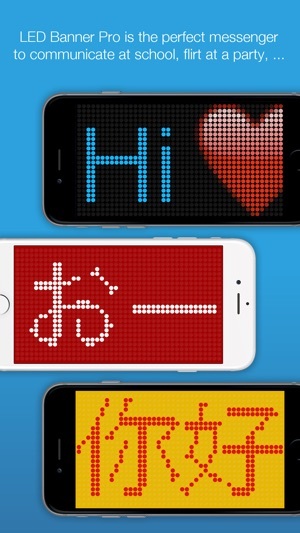 LED Banner Pro is the perfect messenger for your iPhone, iPod touch and iPad. Use it to communicate with others when you don't want to attract attention to yourself, when speech doesn't work or when it is too loud. 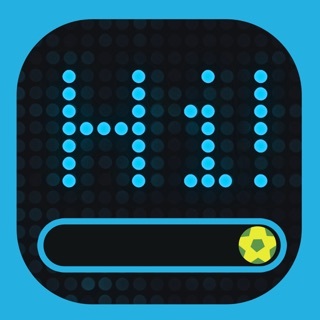 Simply enter your message and click "PLAY". 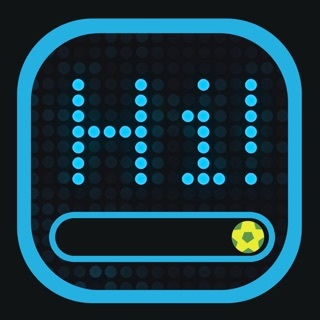 The message will be shown as a huge banner on the display so anyone can easily read it, even at a distance. 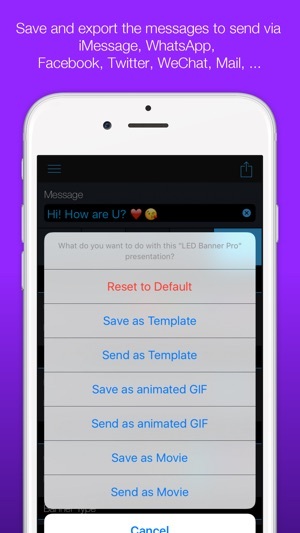 LED Banner Pro is the only banner app that can e-mail and save created LED banner animations as templates, MP4s or animated GIFs. Try it today! 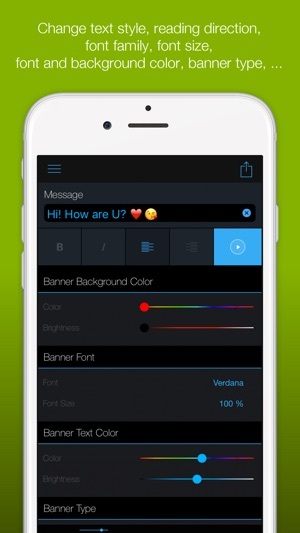 No other LED banner app offers you these features! Follow on message - I found out you can click the blank area in the upper right hand corner of your screen and get the share/send options pop up. Working on trying to save ... but otherwise really fun. It even has an option to do a mirror-reverse image, so you can put it up on the dash, and person in front of you can theoretically read it in their rear-view mirror. Handy for those “slower traffic keep right” or “right lane is for passing only” situations where you get stuck behind Ma and Pa Kettle in the 65 chevy pickup who think the speed limit is still 55. This does everything most people would want, but one thing is missing. While there appears to be provision for a “library” of messages, there is no apparent way to save messages to that library. 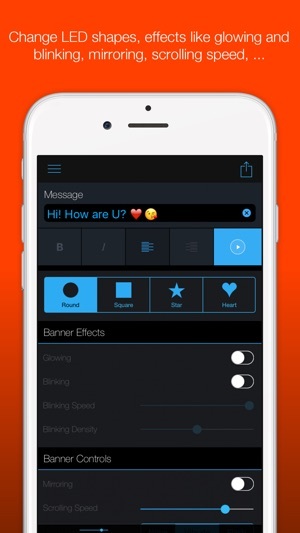 If you close the app after creating a customized message, you have to recreate that message from the beginning to have it available. And thus, of course, you cannot jump from one message to another. 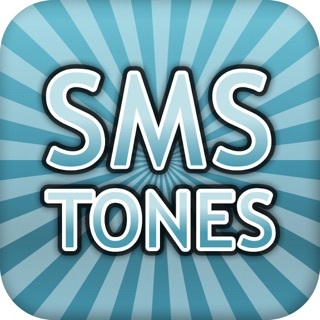 This app is great, I really like it, the only thing It's missing is a steady option. 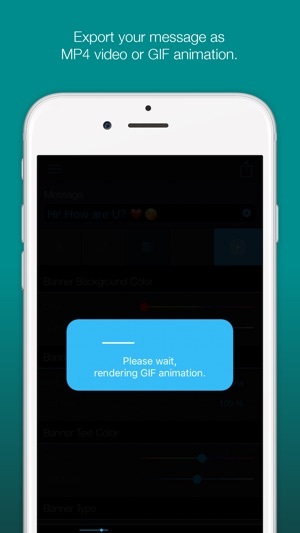 You have the option to have your message scroll very slow or super super fast, but it won't keep it still. I was hoping for that option. Another thing they should add is being able to have two lines. Other than that, I like it. 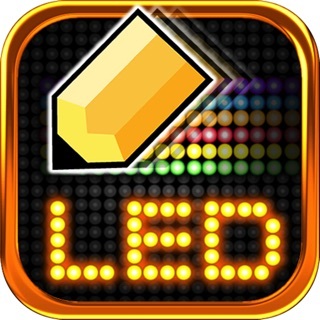 LEDhit – SMS & Text Your L.E.D Banner Message or Share to Facebook, Twitter & Instagram.